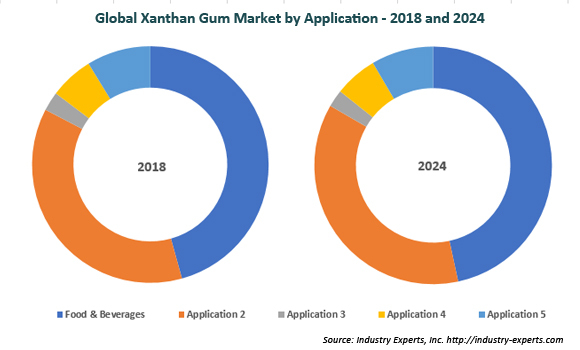 Largely Driven by Food & Beverage and Oil & Gas Sectors, Global Demand for Xanthan Gum is Forecast to Reach 323K Metric Tons by 2024 - Market Report (2018-2024) by Industry Experts, Inc.
Industry Experts, Inc. introduced the comprehensive global market report on Xanthan Gum. The new report entitled "Xanthan Gum – A Global Market Overview" reveals that the global market for Xanthan Gum is estimated to cross 240 thousand metric tons in 2018. Food & beverages and oil & gas sectors are the two largest consumers of Xanthan gum globally, where these two applications segments are estimated to corner a market share in excess of 80% together. Xanthan gum is used in wide range food products, such as sauces, dressings, meat and poultry products, bakery products, confectionery products, beverages, dairy products, others. Commercially, Xanthan gum is available in several grades for food & beverages, pharmaceutical, personal care, agricultural, household, oil& gas and other industrial applications. Global market for Xanthan gum, estimated at 240 thousand metric tons in 2018, is further projected witness a CAGR of 5.1% through to the period 2024. Food & beverages is the largest application segment for Xanthan gum with an estimated share of 46% while the segment also witnesses the fastest growth during the aforementioned analysis period. This global market report reviews, analyses and projects the Xanthan Gum market for global for the period 2015-2024 in terms of volume as well as USD. Xanthan Gum applications analyzed in the study include food & beverages, oil & gas, pharmaceuticals, personal care & cosmetics and other applications comprising agriculture, household and industrial. The study extensively explores the regional markets of Xanthan Gum consisting North America – the United States, Canada and Mexico; Europe – Belgium, France, Germany, Italy, Russia, Spain and the United Kingdom; Asia-Pacific – Australia, China, India, Indonesia, Japan, South Korea and Thailand; South America – Argentina, Brazil and Venezuela; Rest of World – Oman, Saudi Arabia, South Africa and United Arab Emirates. This 302 page global xanthan gum market report includes 216 charts (includes a data table and graphical representation for each table), supported with a meaningful and easy to understand graphical presentation, of the market. This report profiles 12 key global players and 26 major players across the North America – 7; Europe – 4; Asia-Pacific – 14; and Rest of World – 1. The study also provides the analysis on industry landscape with production capacities of major players. The report also provides the listing of the companies engaged in research & development, manufacturing and supply of xanthan gum. The global list of companies covers addresses, contact numbers and the website addresses of 122 companies.